Gouramis like a well planted tank with slightly acidic water and are happiest when they have plenty of hiding places, though they'll also need free swimming space to dart about. Though they're generally peaceful, the males can be quite territorial when they're ready to breed, so it's best not to keep more than one male unless you've got enough room for each to establish his own territory; however, gouramis are shoaling fish and large numbers of females can be kept together without problems. They are friendly by nature and will get along well with any non-aggressive tankmates. Just one male and one female should be selected for breeding at one time, and they should be placed in a special breeding tank with low water (six to eight inches will do) and plenty of vegetation. Fairly large grained, loose gravel or pebbles will be useful to the male as he builds a bubble nest. When he's ready, he'll try to lure the female into this and persuade her to lay eggs. Bear in mind that males can be quite aggressive at this stage, so it's important that the tank contain plenty of hiding places where the female can escape from his advances. 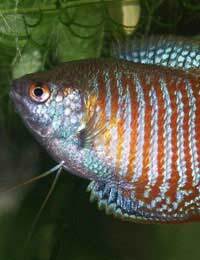 After spawning, the female gourami should be removed from the tank. The male will make a good parent, tending the eggs and fry and sometimes spitting water into the air as he endeavours to keep everyone safely in the nest. Once the fry hatch they can be fed with infusoria and tiny brine shrimp.